Venus and the crescent moon meet up in the morning sky on June 24, 2014. The moon will appear to pass below the bright planet. It should be worth any skywatcher's while to set an alarm for 60 to 90 minutes before sunrise tomorrow (June 24) to see a very pretty celestial scene. And if you have binoculars and look early enough while the sky is still relatively dark, scan about 10 degrees above Venus for a view of the famous Pleiades star cluster, now just beginning to emerge back into view after being hidden in the glare of the sun for the past month. Venus currently rises about 5 to 10 minutes after the first light of dawn. 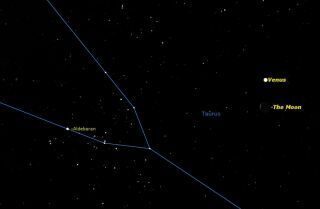 In the coming weeks, as the planet follows the sun through the northernmost part of the ecliptic and across the constellations of Taurus and Gemini, it will actually appear to rise at — or even just a little before — the break of dawn. The planet will continue to rise in that fashion from July 10 through Aug. 4, roughly two hours before sunrise. By mid-August, however, Venus will be rising only about 90 minutes before sunrise and will rapidly sink lower into the bright morning twilight with each passing morning. Venus will be all but gone from the morning sky by the end of September. So, in spite of the ungodly hour, get up early Tuesday morning and catch a view of Venus while it is still readily visible. As it rendezvous with Earth's nearest planetary neighbor, the moon will create a lovely celestial tableau to greet you on an early summer morning. Editor's Note: If you have an amazing photo of the Venus conjunction with the moon that you'd like to share for a possible story or image gallery, please contact managing editor Tariq Malik at spacephotos@space.com.